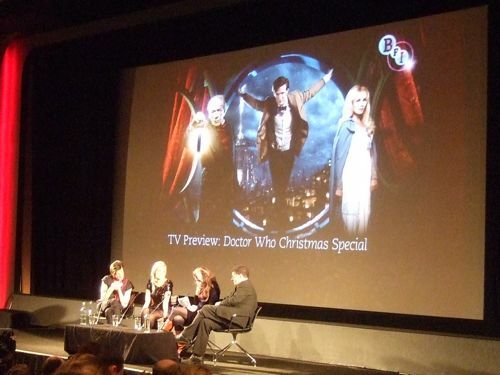 The BFI Southbank in London tonight for a preview screening of the 2010 Doctor Who Christmas Special – A Christmas Carol. 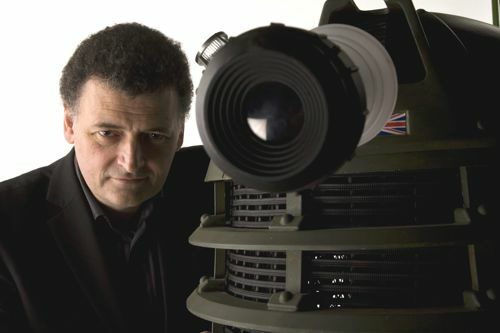 Followed by a Q&A – chaired by journalist Caitlin Moran – with Matt Smith, who plays the 11th Doctor, Katherine Jenkins, who guest stars as Abigail Pettigrew, plus lead writer and executive producer Steven Moffat. Which was later thrown open to the audience, including a fishy question from Karen Gillan (Amy Pond) in the stalls. First the hour-long festive special. If you’re avoiding ALL spoilers, then best go elsewhere. It’s a totally bonkers episode but probably a perfect fit for 6pm Christmas Day on BBC1. 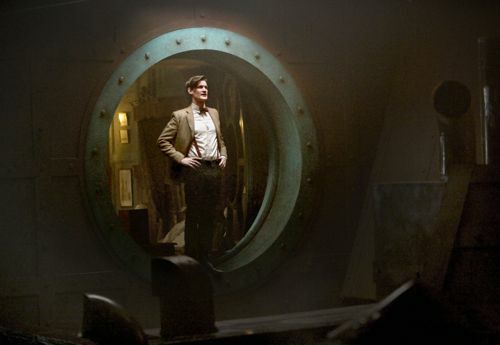 As many fans will already know, this adventure is set on Christmas Eve and features newlyweds Amy and Rory (Arthur Darvill) on a stricken space liner heading for disaster. With mayhem up on the Star Trek-style flight deck, Amy emerges from the Honeymoon Suite dressed in the police uniform from her very first episode. And Rory is back in his Roman centurion outfit. A nice opening visual joke from Mr Moffat, who was placed in seat K9 for the screening. He weaves Charles Dickens’ classic A Christmas Carol into this tale from a strange yet still familiar world. High above, the Galaxy class ship is plummeting through banks of thick icy fog towards the surface of the planet. Only rich and bitter old miser Kazran Sardick (Michael Gambon) can save the lives of the 4003 people on board. He controls the skies, despises Christmas and doesn’t care if they all die. Kazran already keeps some residents of Sardicktown frozen in ice, including Abigail. And appears to have lost every shred of goodness that might ever have been in his heart. Which is when the Doctor, covered in soot, comes tumbling down the chimney. Can he bring this old man out of the dark and into the light? Older viewers may have to stay off the Christmas sherry to keep track of all the details in this hour. Including sharks out of water, a nod to Jaws and the Doctor’s trips to the 1950s to hang with Frank Sinatra and The Rat Pack. Not to mention Marilyn Monroe, Albert Einstein and Santa. All contrasting with the bleak midwinter under the dark skies of Sardicktown. We also get more information about the Doctor and girls. There are crackers, a kiss (not involving the Doctor) and photographic evidence of trips around the globe. 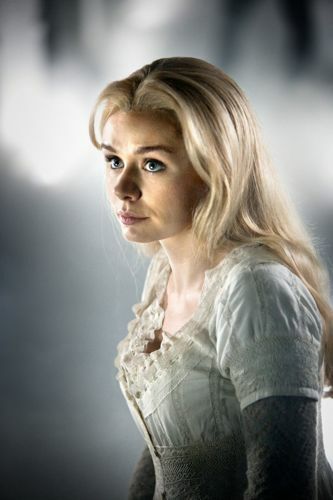 We also hear Katherine Jenkins – making her acting debut – sing a new Christmas carol, among other vocal performances. 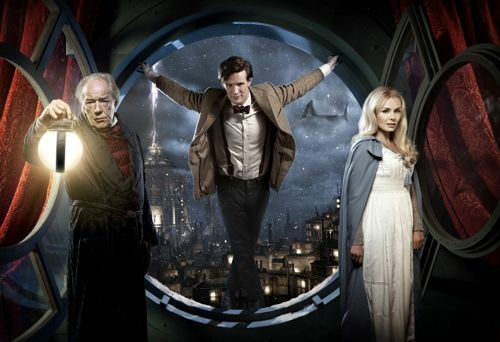 The screening was followed by a trailer for the 2011 series, which included Nazis, The Oval Office, a spaceman, various monsters, the Doctor in a Stetson and River Song in cowgirl mode. Do you think the circumstances that you wrote it contributed to it being quite so nuts? 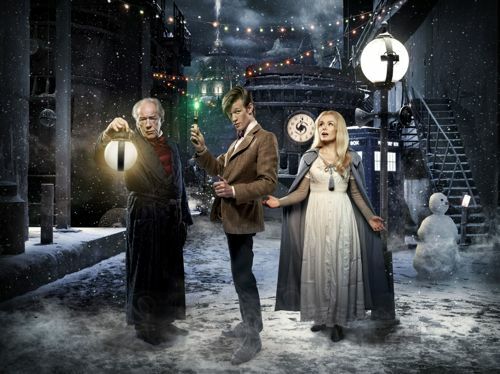 Do you think Christmas specials have to be sad and funny at the same time? So aside from being nuts, it’s also a love story, which is where Katherine comes in. You were so nervous about watching this tonight? In your career, you’ve done quite a lot of nerve-wracking things. You’ve sung in front of the Pope, you’ve opened the Rugby World Cup, you’ve sung at the Nobel Peace Prize concert, which I didn’t even know existed. Is that the most nerve-wracking thing that you’ve done? What was it like when you found out you got the role? Could you cry for real? An amazing year for you, Matt? This time last year you were about to sit down and watch the Christmas Day Doctor Who like everybody else. What was your last Christmas Day like? Were you thinking about your own Christmas special last Christmas? Does it ruin Christmas Day that Doctor Who is the big show. Are you nervous? What has been the most surreal point of this year? Because you’re instantly famous? How do kids react when they see you? Presumably it means you have to behave quite well in public. You can’t now go out and fall over and get drunk or shout and swear? Working with Sir Michael Gambon. He has a lot of stories to tell? In this episode you particularly realise how rubbish the Doctor is with girls and just how nervous he is around them. Or is he pretending? What would you get the Doctor for Christmas, after 900 Christmases? Focus this year on bow-ties and the fez, with Stetson next year. Anything Matt can’t go out in? Any historical periods you’ve not done yet that you’d like to have a go at? *The shark was codenamed “Clive” on set to keep it a secret. *Steven said he has an even bigger idea for next Christmas. But would give no details. Katherine said her screen kiss was “the most stressful part” of the filming. The new Christmas carol? Is that going to be released and who wrote it? Matt – what was your most embarrassing moment? Not often do you get to hear an audience reaction? Steven – what line was your favourite? Matt – what was the most exciting part in the film? Does the (sonic) screwdriver do actually all the things it does in the movie? 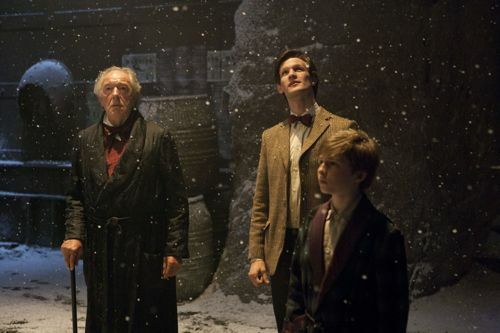 *Doctor Who: A Christmas Carol is on BBC1 at 6pm on Christmas Day. Posted in Doctor Who and tagged Arthur Darvill, Caitlin Moran, Doctor Who, Karen Gillan, Katherine Jenkins, Matt Smith, Steven Moffat. Bookmark the permalink. I’ve heard about him breaking these sonics but I didn’t know it was actually true … ha ha, that would be totally the sort of thing I’d do, I break everything. I can’t wait for this episode!